while I appreciate its easier to let the app sync across my devices via this account (no idea where the data is being stored/if secured), the reason I was interested in trialling 1password was the fact it said it could sync OFF cloud, via WiFi or via my local shared device. You're signed into a 1Password.com account which means sync is handled for you, as such several tabs aren't shown in any of the settings because they don't have applicability in the world of 1Password.com accounts. You would need to turn on local vaults in the various places (on Mac its the bottom checkbox on the Advanced tab) in order to use local vaults. you sir, are a scholar!! @moof -- you're quite welcome! However, be aware that you cannot sync your 1Password account vaults via WLAN or Dropbox or in fact any other method than the 1password.com sync server itself. That's why those other options are not available by default if all you have in 1Password for Mac is one or more 1Password accounts. If you want to sync your data via WLAN, iCloud or Dropbox, you'll need to transfer your data from the vaults of your 1Password account into one or more local vaults, then set up the sync option of your choice for those vault(s) individually. You'll also need to cancel your subscription to 1password.com and purchase a standalone license for 1Password, plus potentially other licenses to unlock the Pro features of either 1Password for iOS or 1Password for Android (or both). All of this can be done, of course -- I just want to make sure you're clear on what all of this means. Let us know if you have any follow-up questions! all good sir, all good. Thank-You! I'm considering being a possible convert from_ mSecure. _ The very feature I went to them for was WiFi sync cross platform. They brought out version 5 and royally shafted ALL that only wanted to ever share their data locally or via a sync method of their choice. They forced every v5 user to use THEIR secure (?) data centre. With mSecure wifi sync, to get your data between two Macs you had to have a middle man, your iPhone or Droid. But I could sync 2Macs/1droid/1iPad...all off cloud, securely. Admittedly this was not the most automated method, very manual in fact, but it worked and I felt safe and in control of MY data. When I fired it up on Family account and let my data sync the account way, well it just works! but who are you? why should I trust you? these are my crown jewels I'd be entrusting you with. The keys to my kingdom! Having figured out I cant sync 2 Macs, a droid and an iPad easily via WLAN, i'm a bit puzzled how I can host my OWN data file, say on a NAS, and share amongst my devices in my own secure cloud. Any thoughts on achieving that? @moof -- The configuration of devices you've described isn't just difficult to sync via WLAN, it's impossible to do directly. 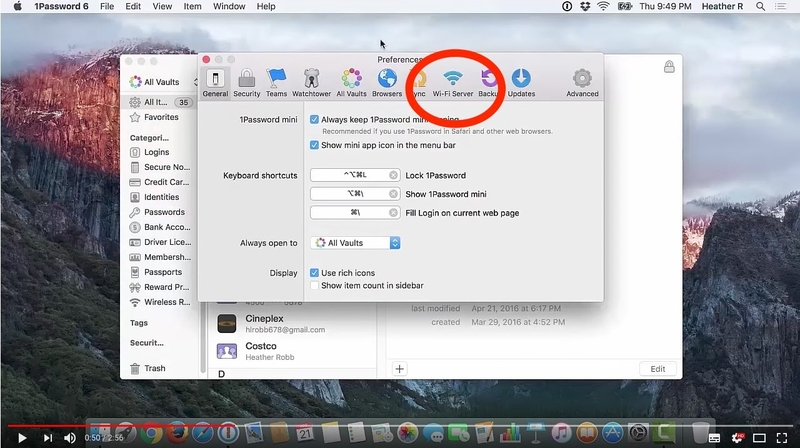 WLAN sync is a method of syncing one copy of 1Password for Mac or Windows with one or more mobile devices. It's a server-client model, so as soon as you have two computers, it doesn't work to sync your data directly via WLAN. We explicitly do not support syncing to a NAS drive. Some users have reported success doing so, but as we have no ability to troubleshoot specific networks or third-party sync solutions, this is done at each user's own risk. The possibility of data duplication or even loss exists in such a setup (however remote it may be), and AgileBits cannot be responsible for any issues which may arise in such cases. One of the reasons we created 1password.com accounts is exactly what you're starting to see from the inside: the unpredictability and relatively less stable nature of attempting to support a galaxy of individually homebrewed sync setups. Considering the importance of the data most people store in 1Password ("crown jewels" was your phrase, I think?) we just are not comfortable recommending such solutions or attempting to support them. We take not only your privacy and security very seriously, but also the trust you place in us that our software won't leave you high and dry without your most valuable data. With every non-account sync option you see listed as supported (WLAN, iCloud, Dropbox), a great deal of testing, custom code-writing and ongoing maintenance has gone into making sure we can live up to those expectations we place on ourselves and others rightfully place on us. And that attention to detail and to the integrity of your data is even more a factor in 1password.com accounts. Simply put, a 1Password membership is the most robust and secure way there has ever been to use 1Password. You asked why you should trust us, and you won't find any of us objecting to your sense of caution regarding your "crown jewels" -- in fact, we applaud it. To answer that question, one way you can be more comfortable trusting us is by noting the fact that we have never had a data breach, either in the days when 1Password was only local vault-capable, or in the nearly two years since we've been running 1Password.com. We're also trusted and used by millions of people, including many security experts. Finally, it's worth pointing out that you've already chosen to trust us if you've been using any of the 1Password apps, so if we were planning to be evil with your data, that ship has already sailed to some degree. 1Password is not open-source, so there's no way for you to have direct visibility into what we might be doing internally within the data you enter or import into our apps. So it's always seemed a bit odd to me to trust a company's integrity and technical chops enough to enter all your most-valuable/secret data into their application but not enough to trust they bring the same level of integrity and competence to the provision of a hosted solution. If you'd like to drill down into the real nitty-gritty of how we keep your data safe with 1Password accounts, I recommend our security white paper -- and if you have any questions about it, feel free to ask. Have a great weekend! Lars, really appreciate your time to give such a detailed reply. I was eyes deep in reviews, hacker news, and anything 1password related via Google when you posted. ...and IMHO I'm liking what I read. I've been an Apple tec for 30years, but I've always supported being platform agnostic. Yes putting my data anywhere but under my mattress, frightens me.... but I cant access it from under that mattress if I want it 24/7 and all my devices, seamlessly. Add to that trying to change family members security habits is very important to me. So I want a shareable/growable solution to our password needs. I started life on PasswordWallet - Selznick but moved on because of a lack of a cross platform sync solution (back in the day - a Wednesday), _mSecure _became my next stop (because you could WiFi sync off cloud) but their recent change of model really threw a spanner in my works and I began to question is their way right for me. Yours and others quick responses and detailed answers to my finding my feet questions are giving me that warm and fuzzy feeling that this could be a great move. @moof -- thanks for the kind words! We really appreciate it. A lot of people work very hard to make 1Password the best password manager possible, and some of that involves explaining the decisions we've made, why we made them, and why we think that's a good solution for most people. No single product is for everyone, however, so we're always appreciative of the opportunity to make our case for 1Password in good faith, knowing that people may come to different conclusions. If you ever have any questions or thoughts, we encourage you to drop by and let us know. One of the things we feel most fortunate about of all, in the 11 years we've been doing it, is how engaged our user community is. It's folks like you - whether brand new to 1Password or from the 'been with us since the beginning' crowd, who really drive us to keep moving forward. Thank YOU!